For other uses, see Castile. 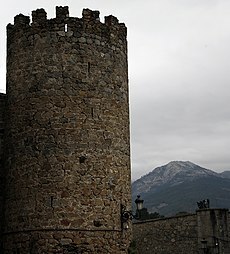 Old Castile (Spanish: Castilla la Vieja [kasˈtiʎa la ˈβjexa]) is a historic region of Spain, which included territory that later corresponded to the provinces of Santander (now Cantabria), Burgos, Logroño (now La Rioja), Soria, Segovia, Ávila, Valladolid and Palencia. Its origins are in the historic Castile that was formed in the 9th century in the zone now comprising Cantabria, Álava, and Burgos. In the 18th century, Charles III of Spain assigned to the kingdom of Castilla la Vieja the provinces of Burgos, Soria, Segovia, Ávila, Valladolid, and Palencia. The royal decree of 30 November 1833, the reform of Javier de Burgos (see 1833 territorial division of Spain), established the basis for the division of Spain into provinces that, with a few modifications, continues down to the present day. Historical region of Old Castile. Another royal decree, on 30 November 1855, divided Spain into 49 provinces, and assigned the provinces of Valladolid and Palencia to the Kingdom of León, leaving to Castilla la Vieja only Santander, Burgos, Logroño, Soria, Segovia, and Ávila. Although there were further reform efforts in the 19th century, this division is reflected in the encyclopedias, geographies, and textbooks from the mid-19th century until it was superseded in the second half of the 20th century. For example, early editions of Enciclopedia Espasa, of the Encyclopædia Britannica and the popular student encyclopedia Álvarez all follow this division of provinces into Castilla la Vieja and León. 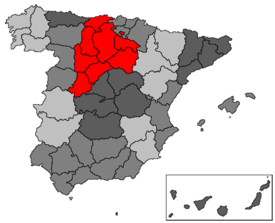 With the establishment of the autonomous community of Castile and León in 1983, Castilla la Vieja lost a large portion of its separate identity: (1) it was integrated politically with León into a larger entity; (2) but two of its provinces became autonomous communities in their own right (Santander became Cantabria and Logroño became La Rioja). This article draws on the corresponding article in the Spanish Wikipedia, retrieved March 1, 2005. This page was last edited on 7 March 2019, at 21:19 (UTC).